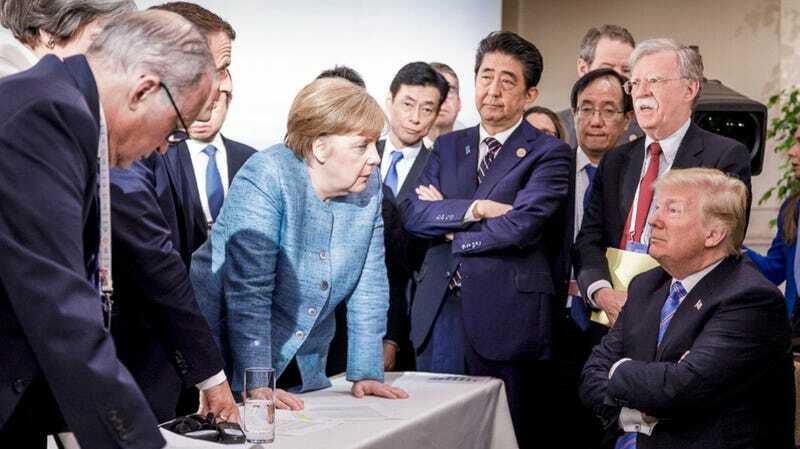 Is this a photograph of the leader of the free world at the G7 Summit, enjoying the company of his peers and intellectual equals? Or is this a sleepy lil’ salamander who woke up from a nap and simply doesn’t wanna? Over the weekend, Donald Trump did his due diligence by at least showing up to the G7 Summit in Montreal, where his presence was widely regarded, by our allies, as destructive. Mostly, America’s biggest baby had a hard time keeping his eyes open because he didn’t really want to be there in the first place. Mr. Trump never really wanted to attend the Group of 7 meeting, but aides pressed him to go even as they feared it would be a disaster because he was being forced to do something he did not want to do. He rebelled by showing up late and leaving early. During closed-door meetings, Mr. Trump largely listened through most issues, firmly crossing his arms and swiveling a bit in his seat, according to people who were in the room. At points, he looked around trying to catch the eyes of others, as if looking for reassurance, the witnesses said. Some smiled back; others did not. He arrived 18 minutes late for a Saturday session on gender equality and did not bother putting his headphones on for translation when President Emmanuel Macron of France spoke. At some points, Mr. Trump closed his eyes in what people in the room took to mean he was dozing off. When Trump wasn’t taking a nap or acting as if he had to desperately use the restroom, he was getting puffy and mad like a bufo toad, “mocking and insulting other leaders, particularly Mr. Trudeau, Mr. Macron and Chancellor Angela Merkel of Germany.” What is most alarming about Trump’s behavior this weekend—aside from his lack of diplomacy, the effects of which we will be feeling for some time—is that he will soon be meeting with North Korea to negotiate a nuclear agreement. This was practice. We’re doing great.